Midnight show guests included DeAnne Smith, Liza Treyger, Colin Quinn, Eman El-Husseini and Pat Thornton. Andy Kindler was on fire for the third of five Alternative Shows at JFL42 this week. It was a somewhat smaller crowd than the previous night's audience, which Kindler didn't hesitate to point out constantly and in great detail, but it did nothing to deter his high-octane performance. Kindler, as usual, made a comedic riot out of "dying" on stage, as is his forte. He described all of his jokes as "el dente"; never quite ready for the stage. After calling the wisdom of that approach into question, he began telling jokes about Y2K. Because Why not 2k? 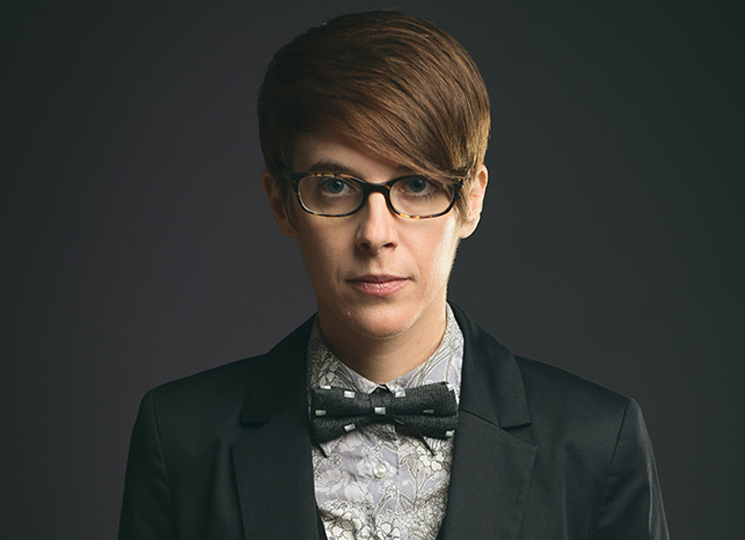 Guests on Thursday's show were DeAnne Smith (pictured), Liza Treyger, Colin Quinn, Eman El-Husseini and Pat Thornton. Kindler had the strongest night of the lot, but the highlight guests were the first two comedians of the night: Smith and Treyger. After Kindler's introduction, Toronto's own DeAnne Smith kicked off the first act with a big awkward bang, in the shape of a surprise can of tuna flung at what was presumably a first-row critic, after treating all other first row members to trail mix. The strange gesture was enjoyed by the audience but seemed to get little more than a furrowed brow from the stone-faced target. Smith ploughed on nonetheless through some great bits on hitting middle-age, including how to tell you're middle-aged by math-based tragic death and the kind of dog you walk. Her goofy "resting lap dance face" closer was brilliant. Most memorably, her set was peppered with throwing additional cans of tuna at her lukewarm favourite. The distinctly unanimated Liza Treyger — known for having a very blue sense of humour — won the audience over instantly with her memories of boy bands, concerts and Israel. Treyger always performs as though she's having a conversation with somebody two feet away from her. Her ugly members of boy bands as parental alarm system theory was hilarious. Her recounting of what birthright trips are for Israeli teenagers is a classic and, as always, it brought the house down. It's always difficult to tell at midnight shows whether the crowd got a little sleepy halfway through the night or if the comedians did. The performances after Treyger were all funny in their own right, nobody came close to dying on stage — much as Kindler might attempt to do so — but the energy in the room tapered off subtly but unmistakably when Treyger left the stage.